Cutting-edge control room visualization solutions allow a seamless working environment and make control room operations efficient and secure. Today’s technological advancements had made control rooms more tolerant to fault. Several industries including broadcasting facilities, traffic authorities, crisis centers, and other similar industries require innovative and efficient solutions to best analyze the information and take productive decisions. This document addresses cost-effective technologies ideal for use in a control room environment. Control room solutions play a major role in sharing high volume of data and information accurately. Moreover, it gives users the ease of operating and taking decisions faster. Modern control room solutions manage, capture, extend, display and even record the data. This ensures maximum reliability and long product life cycles. This document comprises an elaborate view on selecting video wall displays. It also gives information about Arista control room solutions and how they are effective in a control room working environment. 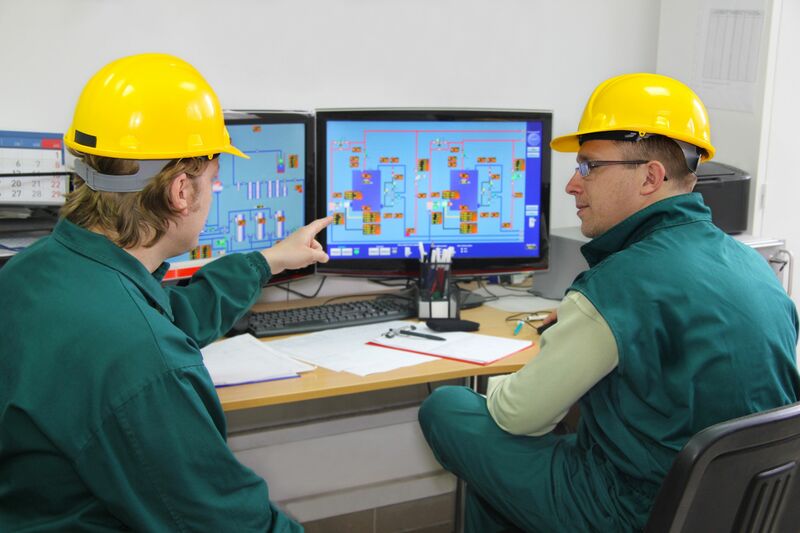 Process centers and control rooms need a fully integrated monitoring and visualization system. This allows flexible operation of complex data and allows users to have complete control over real-time view with easy to use functionalities. The end users want to connect with technology driven model that are able to perform 24/7 and under challenging work environment. Users also seek real-time opportunity to track progress of every event, thus innovative control room solutions are a prime need of a control room environment. With internet connectivity information can be transferred across the globe and end users are able to display the information on any screen. Most of the control room solutions are designed with flexible functionalities that can be used in any industry. The entire control room solutions are designed to give an innovative and intelligent approach to share relevant information. LCD (liquid crystal display) is the most common technology used in monitors and televisions.LCD in a video wall solution is a flat panel display with light modulating properties that displays an image. For large-scale video wall LCDs uses the LED (light-emitting diode)-back-lit through the liquid crystal to produce image. Majority of LCD display are TFT (thin-film-transistor), an active-matrix controlled by one to four transistors. The two commonly used TFT varieties are, TN (Tisted Nematic) and IPS (In-Plane switching).Major difference between these are the crystal molecules, TN panel move molecules parallel to the plane, while in IPS, they move perpendicular. High Resolution and brightness: LCD panels embed high-resolution functionality. Since pixel density is high, LCD delivers sharp, crisp, and crystal clear images without causing pressure/stress on eyes. A critical control room environment require 24/7 connectivity, most of the LCD panels offer high brightness and can be adjusted for a better view according to the work environment. Touch Gesture: LCD displays are also available with multi-touch control, this allow users to directly interact with the information. Touch screen functionality eliminates the time for additional installation and delivers more accurate results for critical work. Camera appearance: LCD video wall provides clear, solid and unbreakable view when dispersed over cameras. Unlike the older CRT technology the LCD syncs in a lesser time without breaking the image. Uniform display and color: LCD video walls offer precise, sharp and uniform distribution of visuals. This ensures greater reliability and less fading overtime. Most display TN (Tisted Nematic) panels displays 6-bits per RGB color and are able to represent 18 bits of total 24 bits color available from graphics cards. With professional IPS LCD display there are more colors available, thus making IPS more preferred choice among marketing groups. Deploying LCD video walls: The panels are easy to mount and can be aligned at any preferred location. With little maintenance involved LCD panels have extremely long lifespan (over 100,000 hours).Moreover, LCDs are composed with solid state electronics they have great resistance to vibration, humidity, UV light and harsh working conditions. Cost and maintenance: Since display technology is improving continuously, it provides better features in a cost-effective manner. Latest video wall displays require less setup costs and deliver high quality visuals. Moreover, with high-end functionality and low maintenance expenses over traditional systems, video wall drastically lowers down the overall costs to the customers. Inappropriate lighting: In almost every control room setup, video walls or other similar screens are a prime source of work. Majority of critical data is collected and analyzed through it. For operators to have the ease of viewing, lighting arrangement should be appropriate and should not cause distraction in viewing screens. Many times reflection from different sources can give an unclear view; ideally operating view should be in the direction where no light is reflected. Users should make use of proper display settings and adjust the brightness & contrast level as per the environment. Such abrupt conditions create hindrance in a seamless workflow. Ergonomic distress Often there is no proper support or sitting options available for operators at workplace. This can result in a wrong posture and make them less active and productive at their job. Video walls and other screens should be arranged at appropriate angle so that users do not face any discomfort. Using wrong solutions With variety of control room solutions available, it is important to understand that every industry has its own unique needs.Visualization solutions should be selected as per the industry guidelines. Thus consulting and working with an experienced sales representative who can guide you according to the industry requirements is a viable option. Display: While selecting any video wall or monitor going over the brightness and contrast options is a good idea. Make sure the display has the high resolution; provide durable and great results for critical viewing. A control room display solution should be able to work as per desired brightness/contrast level for every specific industry. Additional components: Like mentioned above, each application needs are different and for handling critical data several input sources are needed. Make sure to select the one that best fits the display and deliver maximum productivity. Upgrade and maintenance: With technology changing at a rapid rate, it’s crucial for users to make sure what their upgrades, maintenance and replacement options are. The core of Arista Video Wall Displays is ADM-5855VW LCD Module which is 55″ super narrow bezel, 1920 x 1080, 16:9 LCD display with built-in controller. With ADM-5855VW, video wall can be built in any matrix layout, 2×2, 3×3, 4×3, etc. and up to 132 in total. ADM-5855VW is designed for easy installation, maintenance and operation. It is an excellent solution for both large and small control rooms, especially where space is limited. ADM-5855VW LCD module for video wall employs the latest “super narrow bezel” LCD displays with LED back light. This LCD video wall display is expandable and can grow as per increasing requirements. Select from four up to 32 high-definition LCD screens. The Arista ADM-5855VW LCD Module for video wall has built-in controller and all modules are daisy chained which allow building the LCD video wall display with as many screens as space allows. The video source of each LCD module fed video signal via video splitter outputs and video splitter video input is connected to original video source. The setup software runs on the computer which communicates with video wall via RS-232 interface or via USB to RS-232 interface. The setup software lets user define the layout of video wall and adjust the width of LCD module bezels. After the setup data is stored in the controller of the LCD modules, the setup will remain the same every time the video wall is powered on and the computer running setup software is no longer needed unless the layout change is required. Refer the diagram below for connection of the video wall. Arista’s MultiMonitor Thin Clients allows ThinManager users to display up to five screens on a single thin client. MultiMonitor industrial Thin Client can be used to span sessions across monitors and/or run individual or multiple sessions on each monitor. Users can place monitors at any location within the virtual space and span multiple sessions on a single thin client. Moreover, there is an option for using two adjacent monitors to span a single session while two other monitors are each used to display sessions running on other servers. MultiMonitor Thin Client supports spanned resolutions up to 8192 x 8192 with 64K colors for MS Server 2012 and newer. MS Server 2008 and prior are limited to a spanned resolution of 4096 x 2048. Arista’s multi-viewer processors, MVD Series, offers the ability to display multiple video sources on a single LCD display, this has improved the way production control rooms are designed and implemented. Control room environment have multiple LCD monitors across each workstation. Operators need to keep moving back and forth from one screen to another, this often makes the process slower and users are likely to get tired quickly. With Arista’s MVD Quad View Processor, the operator can keep one focal point and view all four screens on one single LCD display. The keyboard video mouse (KVM) extenders are required when Thin Clients or computers are installed far from operators in a control room. Normally, keyboards, video monitors, and/or mouse are located within 6 feet or 2 meters from the source PC or thin client. Arista offers variety of extenders to meet all various video source requirements, either VGA, DVI, HDMI video signal, in control room applications. 4K ultra high definition (UHD) resolution offers high value in a control room environment ,it supports multiple screens deployment. Arista’s BoxPC-138-G00-00D with ThinManager ready thin client 9.0 support Virtual Screens, it also allow users to divide screen into separate display sections. There are 1920 x 1080 pixels for each section when 4K UHD LCD display monitor is split into quadrant view and each section represents a Full HD screen supporting up to 1920 x 1080 resolution. Pushing the envelope on multimedia connectivity between AV sources and remote displays, Arista’s ARD-3001 integrates long distance extension, IP-based switching, and advanced AV signal processing of Ultra-HD video, audio, and control signals into a single box. Arista’s ARD-3001is suitable for use in virtually all AV signal distribution applications including AV/KVM extension, AV/KVM switching, video-wall and multi-view. Using a synchronous, packet-based architecture for pixel transmission, Arista’s ARD-3001 can extend and independently switch video, audio, gigabit Ethernet, and other control signals through off-the-shelf Ethernet switches. Replacing custom AV matrix switches with standard networking hardware dramatically reduces the cost of large scale control room installation while eliminating the complexity of installation. Arista is a pioneer in the industry of product development, engineering, manufacturing and customer support. Originally formed in 1992, Arista has offices in China, India and Taiwan. With years of experience and expertise in Industrial panel PCs, Industrial monitors, Box-PCs and Fanless embedded computers, Rack-Mount Computers, ACP Thin-Manager Ready Thin Clients, embedded CPU Boards and video Extender/Switched. Arista has served customers with reliability, integrity and trust. Information in this document is the property of Arista Corporation. This paper provides an overview of control room visualization solutions, content is subject to change without any prior notification.